Address: The Langham, 1C Portland PLace London, W1B 1JA United Kingdom. Days and times: Daily 12.15pm to 5.30pm. Cost: £27.50 per child. 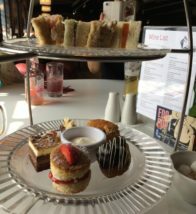 Wedgwood afternoon tea for adults costs from £49 per person. Cost: £58pp or £72pp with champagne. Days and times: daily, from 12pm to 4pm. Cost: £42 or £55 with a glass of Veuve Clicquot. Address: Mondarian London, 20 Upper Ground, Southwark, London, England, United Kingdom, SE1 9PD. © Copyright 2019 news from nowhere. All rights reserved.